The Siberian is Russia's national cat, and a very BIG cat she is, too. This breed is something like a very furry linebacker crossed with a ballerina and shrunk into kitty form. Despite their size, they are capable of leaping to great heights. Honestly, the Siberian doesn't do anything in a small way. Even their fur is big——their coats have three layers! And they needed it: those weatherproof coats helped these cats survive harsh winters in northern Russia. This breed can grow to between 12-20 pounds and lives an average of 12-15 years. WHAT IS THE SIBERIAN'S PERSONALITY LIKE? Super-mellow Siberians get along with just about everybody. They often do well with children, dogs, and other pets in the household. They're also usually happy to meet guests. They love to perform for an audience and have impeccable comedic timing. WHAT IS SIBERIAN BEHAVIOR LIKE? This is not a particularly chatty breed. Siberians are surprisingly agile for their size and will happily leap to high perches. They're also smart and will figure out how to get doors or drawers open if they want something. HOW CAN I KEEP MY SIBERIAN ENTERTAINED? Born problem-solvers, intelligent and attentive Siberians will enjoy learning tricks and commands. You just need to put the time in to teach them. They also really like the water; yours might even try and join you while you shower! WHAT DO SIBERIANS LOOK LIKE AND WHAT ARE THEIR GROOMING NEEDS? Siberians are some of the biggest cats around. Their thick coats get even thicker when it's cold outside. For most of the year, you can get away with brushing them weekly. But when they molt in the fall and the spring, you'll need to brush them every day. WHAT HEALTH PROBLEMS DO SIBERIANS HAVE? 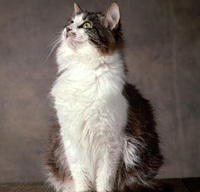 Though generally healthy, Siberians are sometimes susceptible to heart disease. Remember that cats often hide disease symptoms! It's important to bring your furry friend in for veterinary checkups at least once a year. ARE SIBERIANS GOOD FOR PEOPLE WITH ALLERGIES? Siberians are among the breeds generally recommended for allergy sufferers—not because they don't shed (they do, quite a bit!) but because some Siberians' saliva has less of a protein known to aggravate allergy suffers (FelD1). WHAT IS MY SIBERIAN'S BEST DAY? You can rest assured that this cat's going to spend just about every day figuring out where the treats are hidden, whether in her puzzle toys or behind that cabinet door. A very tall cat tree won't go over badly, either. But why not really make your kitty's day and hide toys and treats around the house? She can spend her morning following the treasure-trail you laid out for her. Leave a faucet on to drip in the afternoon and you'll make your Siberian's whole day. SHOULD I ADOPT A SIBERIAN? Siberians are affectionate but not overly insistent. They enjoy your company but are also happy to entertain themselves (as long as you're not away too long). If you don't mind the heavy molting in the spring and fall, these kitties can fit in well into many kinds of household. If you're looking for a smart, resourceful, plus-sized feline companion to keep you on your toes, a Siberian might be just the ticket. Have you decided that a Siberian is the purr-fect cat for you? Why not be your new best friend's hero and adopt a rescue! Be sure to check out our article on what to expect when you're adopting a dog or cat.